Shopping in Vietnam is a feast for the eyes, and won’t cause a famine in your wallet. This is undoubtedly the reason that shopping is such a popular activity here. 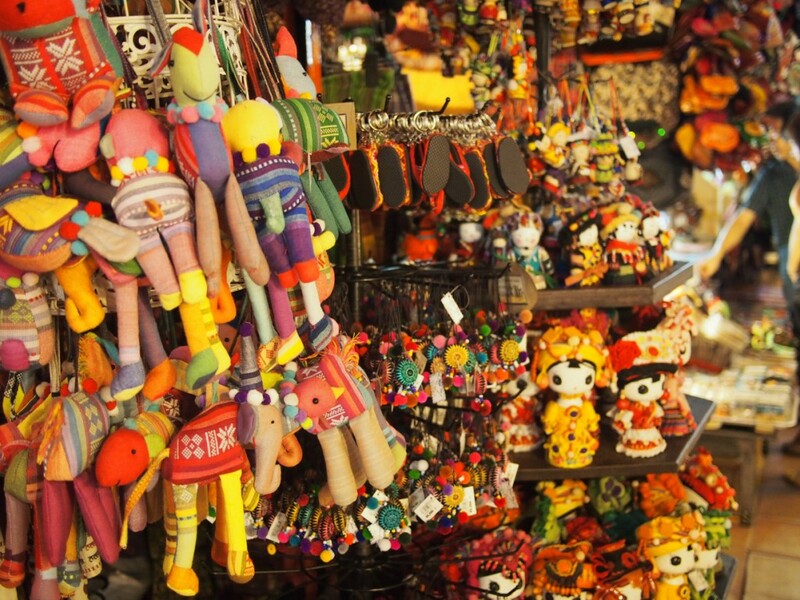 As in most Asian countries, Vietnam beholds a wide array of cool items to shop for, and the prices are generally very low. Here you can have fun shopping for gifts for yourself, your family members, and your best friends, too. One of the most famous places to shop in Vietnam is at the Ben Thanh Market in Ho Chi Minh City. The market is open daily from 7 am to 7 pm, and is a good place to look forâ€¦ wellâ€¦ just about anything you can think of! Some of the most popular items include tee shirts, silk scarves, satin slippers, carved figurines, ethnic coin purses, and embroidered bags. I recommend looking for items in silk and bamboo, as these are traditional Vietnamese handicraft materials, and the local artists and merchants are experts at creating beautiful goods with them. A nice bonus is that the Ben Thanh Market is indoors, and you’ll therefore be shielded from the heat of the day while shopping. To prepare for your outdoor activities in Vietnam, it is a good idea to pick up a traditional Vietnamese conical shaped hat while you are shopping. These are perfect for shading your eyes and face from the hot, tropical sun. While you are at it, you may also wish to shop for some light, breathable clothing. The Vietnamese prefer long pants and long-sleeved shirts that are made of thin fabric, such as genuine silk. The advantage here is that your skin is shielded from the sun, while your garments are still nice, light, and cool. You can find the traditional outfit of a long blouse and floaty pants for sale at many shops in the Ben Thanh Market, as well as The Diamond Plaza, which is a large, multi-floored modern shopping mall. During our upcoming tour of Vietnam, we’ll travel from Ho Chi Minh City, then to Hanoi and Ha Long Bay. All 3 of these places are terrific spots to shop, but you’ll find that each one is different and has its own personality. In contrast to Ho Chi Minh City, Hanoi has more outdoor markets, and here you’ll find that night time is actually the most popular time to shop. The night markets of Hanoi are not just good places to shop for souvenirs, but also fun social events, too, as they have a sort of carnival-like atmosphere. At the same time, the atmosphere is less frenetic and busy than that of the Ho Chi Minh City. It provides a nice balance, and visitors find that they are able to shop and peruse the local goods with very little pressure or stress. In Hanoi, I would recommend shopping for quality textiles, such as clothing and tribal weavings and wall hangings. Definitely also keep an eye out for the gorgeous handmade greeting cards and bamboo-bound notebooks that are constructed from Do paper, made from the bark of the Do Tree. Lastly, you’ll find that Ha Long Bay has an atmosphere and feel all its own. You’ll see many open-air vendors selling traditional goods such as chopsticks and ceramic tea sets. Here you can also see and experience the unique floating vendors of Ha Long Bay. Local people fill up little row boats with snacks, beverages, and small trinkets. Their small boats are usually laden with interesting goods, and very well organized, too. One thing to keep an eye out for in Ha Long Bay is that you may see vendors selling local stalagmites and stalactites. It is important not to purchase these, as they should stay in the caves of the caves and grottos of the area where they belong. Another thing to note in all 3 cities is that Vietnam does not allow the export of antiques. So while shopping, if you have any doubt as to whether an item is an antique, ask the vendor. It is always best to err on the side of caution and buy only new items. Other than that- you can shop to your heart’s content in Vietnam!